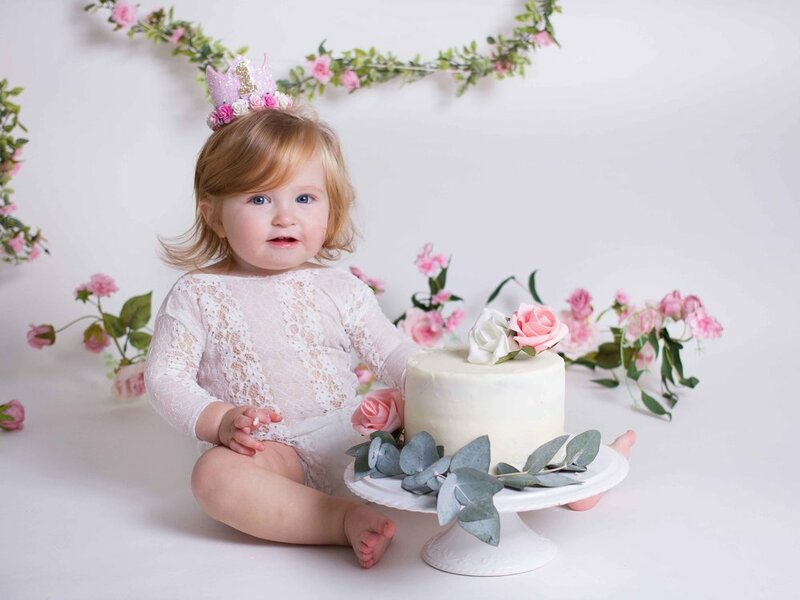 At Bright Eyes Photography we have been creating baby's First Birthday memories with cake smashes for over 7 years. We serve clients from all over the Home Counties including Stevenage, Luton, Dunstable, St Albans, Hemel Hempstead, Knebworth, Welwyn, Cheshunt, Hitchin, Letchworth, Baldock, Royston, Hatfield and London. Whether you want a bright and colourful style with all the razzmatazz, or simple so it's all about the baby, let us help create your special memories to celebrate your baby's biggest milestone yet. Not sure about the sugar for your baby? Why not try a naked cake with fruit? Or a sugar-free jelly smash, fruit smash or watermelon cake smash alongside our usual choice of frosted vanilla or chocolate sponge. Or what about spaghetti? We also run non-food one year mini-sessions. ALL of our Cake Smash packages now come with our delightful MP4 video slideshows to music. Fabulous to show at your child's birthday party to share all the craziness we capture. I am passionate about you receiving good quality printed products and that is why our ALL the packages now include some form of printed product. Quality professional laboratory prints far excel in quality and colour accuracy than anything you can buy on the high street or from a consumer lab. See your digital images as they are meant to be seen. Packages and Prices updated 6.4.2019. Current bookings can choose to stay with the old package or change to the new equivalent one at the new price. This session will be a memory of your child's first birthday so it is important that we make the session theme in a colour and style of your choice. There are lots of favourites and I am bringing out new colours and themes all the time. I am happy to work with you to create your vision of how you want it to be. There are 3 groups of cake smash styling. Modern, Themed and Traditional. Traditional cake smash styles are the older styles, often with personalised or stock bunting, balloons, giant cupcakes and tissue pom poms. Clothing is with nappy covers, bow ties or ruffle rompers and tutus. Quality fabric personalised bunting is available for £20 for up to 8 letters and can be made in a variety of colours and fabric. Add it to your style and take home to hang high in your baby's bedroom. Why not shake it up a bit by having one of our modern cakes and a personalised cake topper for £5 or adding one of our KEEPSAKE PACKS from £12.50? If your child has allergies and you wish to have an egg free/ dairy free/gluten free cake, this can be provided at the cost of £10. Whilst these cakes may be free from the item concerned, the cakes may be prepared in areas which may not be totally free from the particular food. It is for this reason that neither Bright Eyes Photography nor Totally Scrumptious can be held liable for any reaction which may occur. If you are concerned about this in any way, please consider either providing your own cake or doing a jelly or fruit/meringue smash. £15.50 personalised - such as Sam is One or Sam 1 Today plus cake topper may be personalised as well. A welcome back to an old favourite due to popular demand! You think you'll remember all the little details but in truth many of them are lost as life progresses..This is a truly memorable keepsake of your child's first birthday, offering a snapshot of their favourite things, their first words or how many teeth they have. A 16x12 inch pre-designed mounted photo. Categories can be changed to suit the child. Three weeks notice is required in order to design, proof and order the board so that it is ready on cake smash day. An extra photo with the board on our easel is also included and you can take the board home on the day. Payment required when you order from us. Our storyboards are classic and timeless. These print at 16x20 inches and are colour-coded to match your photos. Have a look at our online brochure to choose your storyboard format. So what would you like to do now? To ask a question or check availability please use the contact details at the bottom of this page. It is advisable to check the availability of your chosen date prior to completion of the booking form. You can do this by emailing Jo@brighteyes-photography.co.uk or calling the phone number at the bottom of this page (office hours only please for calls) You can also fill in the contact form that's at the bottom too. Saturdays often book up the quickest. Some Sundays are available. We do not work Bank Holidays unless by special request. The booking/session fee to confirm your session is £50. This is deducted from your package price. The booking fee is generally non-refundable though rearrangement, subject to availability and certain conditions, is allowed. Confirmation of your session is not automatic. A payment request is sent manually from us following receipt of your booking form, usually within 24-48 hours, then booking confirmation will follow once paid. FREE SITTER SESSION if you book early!!! Offer valid for bookings between January and June 2019 for cake smashes dated May to December 2019 - subject to availability. Offer not valid for children who are past the crawling confidently stage.